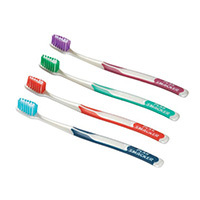 The GUM Classic toothbrush has a handle that is fitted with a synthetic rubber tip stimulator for massaging the gums between the teeth to promote healthy firm gums where the bristles may not always reach. 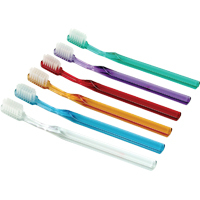 The raised center bristles have been trimmed to form a dome shape that provides greater contact with the tooth surface and reaches under the gum line. 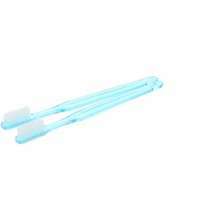 When the toothbrush is angled at the widely recommended 45 degrees to the tooth (Bass technique), the bristles can easily reach under the gumline and into the sulcus to clean away dental plaque.